The more appropriate term for correlating aerodynamic performance in the nonstandard atmosphere is density altitude—the altitude in the standard atmosphere corresponding to a particular value of air density. Density altitude is pressure altitude corrected for nonstandard temperature. As the density of the air increases (lower density altitude), aircraft performance increases. Conversely, as air density decreases (higher density altitude), aircraft performance decreases. A decrease in air density means a high density altitude; an increase in air density means a lower density altitude. Density altitude is used in calculating aircraft performance. Under standard atmospheric condition, air at each level in the atmosphere has a specific density; under standard conditions, pressure altitude and density altitude identify the same level. Density altitude, then, is the vertical distance above sea level in the standard atmosphere at which a given density is to be found. Density altitude is computed using pressure altitude and temperature. Since aircraft performance data at any level is based upon air density under standard day conditions, such performance data apply to air density levels that may not be identical to altimeter indications. 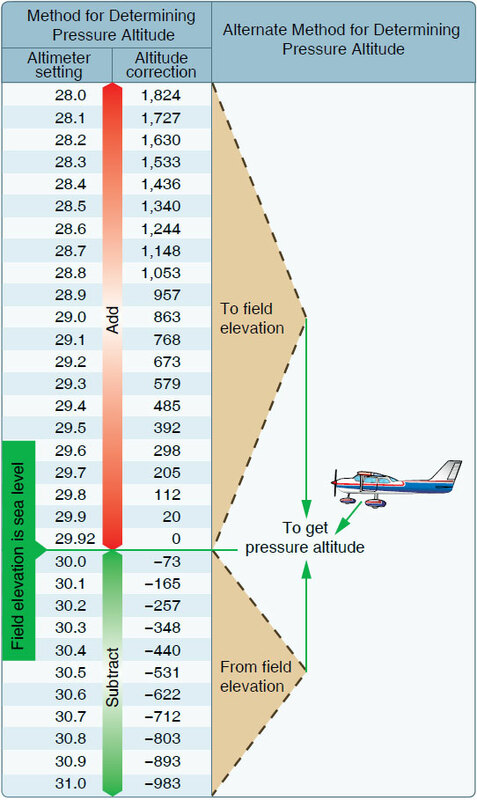 Under conditions higher or lower than standard, these levels cannot be determined directly from the altimeter. Density altitude is determined by first finding pressure altitude and then correcting this altitude for nonstandard temperature variations. Since density varies directly with pressure, and inversely with temperature, a given pressure altitude may exist for a wide range of temperature by allowing the density to vary. However, a known density occurs for any one temperature and pressure altitude. The density of the air, of course, has a pronounced effect on aircraft and engine performance. Regardless of the actual altitude at which the aircraft is operating, it will perform as though it were operating at an altitude equal to the existing density altitude. For example, when set at 29.92 “Hg, the altimeter may indicate a pressure altitude of 5,000 feet. According to the AFM/POH, the ground run on takeoff may require a distance of 790 feet under standard temperature conditions. However, if the temperature is 20 °C above standard, the expansion of air raises the density level. Using temperature correction data from tables or graphs, or by deriving the density altitude with a computer, it may be found that the density level is above 7,000 feet, and the ground run may be closer to 1,000 feet. Air density is affected by changes in altitude, temperature, and humidity. High density altitude refers to thin air while low density altitude refers to dense air. The conditions that result in a high density altitude are high elevations, low atmospheric pressures, high temperatures, high humidity, or some combination of these factors. Lower elevations, high atmospheric pressure, low temperatures, and low humidity are more indicative of low density altitude. Figure 11-3. Field elevation versus pressure. The aircraft is located on a field that happens to be at sea level. Set the altimeter to the current altimeter setting (29.7). The difference of 205 feet is added to the elevation or a PA of 205 feet. Using a flight computer, density altitude can be computed by inputting the pressure altitude and outside air temperature at flight level. Density altitude can also be determined by referring to the table and chart in Figures 11-3 and 11-4 respectively. Figure 11-4. Density altitude chart. Since air is a gas, it can be compressed or expanded. When air is compressed, a greater amount of air can occupy a given volume. Conversely, when pressure on a given volume of air is decreased, the air expands and occupies a greater space. That is, the original column of air at a lower pressure contains a smaller mass of air. In other words, the density is decreased. In fact, density is directly proportional to pressure. If the pressure is doubled, the density is doubled, and if the pressure is lowered, so is the density. This statement is true only at a constant temperature. In the atmosphere, both temperature and pressure decrease with altitude and have conflicting effects upon density. However, the fairly rapid drop in pressure as altitude is increased usually has the dominant effect. Hence, pilots can expect the density to decrease with altitude. The preceding paragraphs are based on the presupposition of perfectly dry air. In reality, it is never completely dry. The small amount of water vapor suspended in the atmosphere may be negligible under certain conditions, but in other conditions humidity may become an important factor in the performance of an aircraft. Water vapor is lighter than air; consequently, moist air is lighter than dry air. Therefore, as the water content of the air increases, the air becomes less dense, increasing density altitude and decreasing performance. It is lightest or least dense when, in a given set of conditions, it contains the maximum amount of water vapor. Humidity, also called relative humidity, refers to the amount of water vapor contained in the atmosphere and is expressed as a percentage of the maximum amount of water vapor the air can hold. This amount varies with the temperature; warm air can hold more water vapor, while colder air can hold less. Perfectly dry air that contains no water vapor has a relative humidity of zero percent, while saturated air that cannot hold any more water vapor has a relative humidity of 100 percent. Humidity alone is usually not considered an essential factor in calculating density altitude and aircraft performance; however, it does contribute. The higher the temperature, the greater amount of water vapor that the air can hold. When comparing two separate air masses, the first warm and moist (both qualities making air lighter) and the second cold and dry (both qualities making it heavier), the first must be less dense than the second. Pressure, temperature, and humidity have a great influence on aircraft performance because of their effect upon density. There is no rule-of-thumb or chart used to compute the effects of humidity on density altitude, but it must be taken into consideration. Expect a decrease in overall performance in high humidity conditions.